Opal is a hydrous variety of silicon dioxide. It is unlike other minerals because it is not crystalline! Opal is made up of sub-microscopic silica spheres, bonded together with silica and water. The lower its original water content, the better the opals chances for longevity. Crazing in opal is created when there is a strain on the gem, caused by loss of water or changes in temperature. The play of color in opals is caused by the silica spheres being packed in an orderly array, which scatters the light in various directions (diffraction). Opals with a play of color are normally cut as cabochons or occasionally carved. Fire: A transparent or translucent opal that is red, yellow, orange or brown. Harlequin: larger, more angular patches that Flash: Flashes, or sheets of color that appear and disappear when the gem is moved. Opals that are transparent can be faceted; some faceted opals have play of color, others do not. The name, Opal, evolved from the Greek "opallios", meaning change of color. The oldest opal mines in the world were located in what is now the Czech Republic. The Czech mines have been documented as being active since the 14th century, but it is probable that these mines were the source for opal in ancient Rome. Czech opal mines were worked until 1932. Mexican fire opal was known to the Aztecs, and introduced by the Conquistadors to Europe in the 16th Century. Opals fell out of favor in the 19th century due to a book that was written by Sir Walter Scott in 1828. After vast opal deposits were found in Australia in 1887, Queen Victoria did her best to dispel any superstitions concerning them, by giving opal jewelry to her children, friends and family. 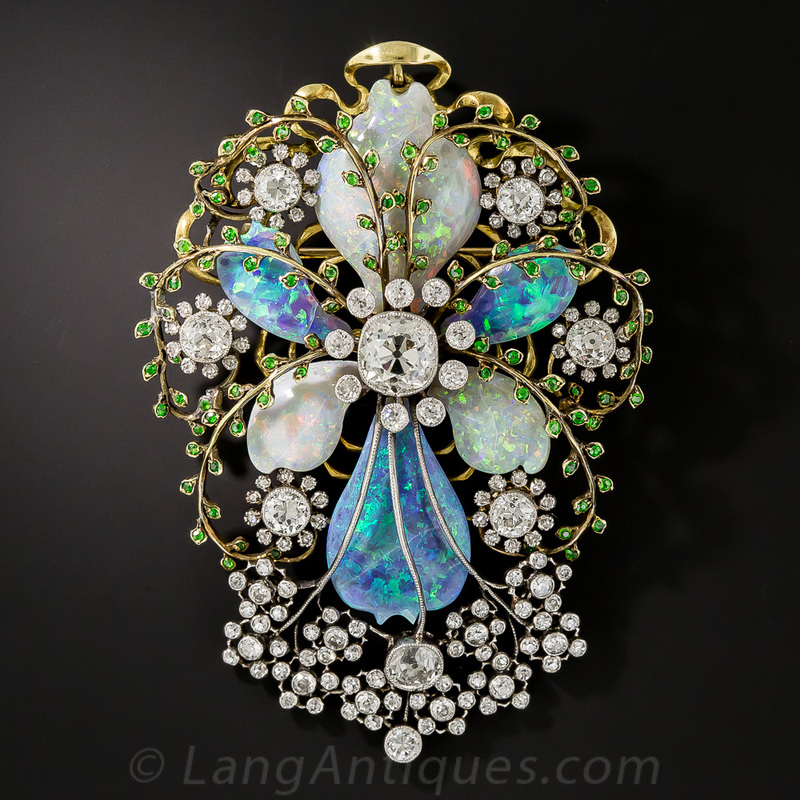 Opal was a favorite of Rene Lalique, the most famous of the Art Nouveau jewelry designers. Lalique's opal jewels designed for Sarah Bernhardt are legendary. Opal is thought to be a gem of inspiration. It fosters creativity and enhances one's imagination. Opals have been used to eliminate nightmares and bring about happy dreams. It is also known to sharpen the memory. Crystal mystics favor opals to help eyesight and aid with Parkinson's disease. Similar Stones: Glass (slocum stone)and plastics are occasionally used to imitate opal, but do so poorly. The only natural substance that resembles opal is labradorite feldspar.